Mercedes recently unwrapped it’s Mercedes-Benz SL 2017 taking the legacy of 300SL ahead. The series came at the 2015 LA Auto Show and is brilliantly designed and housed with powerful engine range. The luxury undoubtedly isn’t compromised when it is coming from the house of Mercedes. 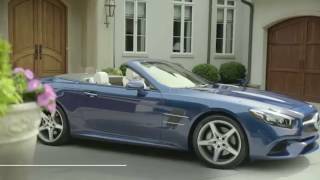 Let us have a look at the review of Mercedes Benz SL 2017 to know more about it in detail. The interior of Mercedes Benz SL 2017 has very few changes. The dashboard comes with new three-spoke steering wheel while the gauge cluster remains same with its dual-tube design for speedometer and tachometer and a center mounted TFT display for little vital information. The seats come wrapped in Exclusive Nappa leather and the option of saddle brown. There is also option of three interior colors that you can choose according your mood. The list includes solar red, polar blue and polar white. Talking about technology, car comes with Apple CarPlay and Android Auto with third party apps like Stitcher Radio, SiriusXM radio and Spotify. Apart from the luxury and looks, interior details of Mercedes Benz SL 2017 have lots of space for both cargo and the passengers. 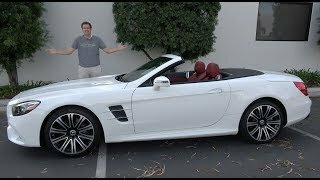 Unlike interior, exterior of Mercedes Benz SL 2017 gets more premium look. Starting with the front fascia, model has traditional grille amidst the new set of LED headlights. Beneath the setup are large air inlets with chrome and carbon fiber accents. Moving towards the rear end, you’ll notice the 19-inch ten-spoke -wheels with an option of six additional designs to choose from. The hardtop can be operated through a push button while the car is rolling and comes with option of Magic Sky Control with which the glass roof changes from clear to opaque in just few seconds. The rear end has new set of taillights sitting at the sides of rear deck lid. 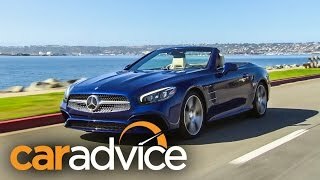 Beneath it are exhaust tips with chrome brightwork giving the model’s rear end an aggressive stance, thus rounding up the exterior details of Mercedes Benz SL 2017 are luxurious and aggression both taking the model lap ahead of predecessors. Beneath the hood of Mercedes Benz SL 2017 are four power options in different trims, namely; SL 400, SL 500, SL 63 and SL 65. The model burst total output of 367 hp, 455 hp, 585 hp and 630 hp respectively and peak torque of 500 nm, 700 nm, 900 nm and 1000 nm respectively. With this power the top speed of Mercedes Benz SL 2017 can touch the mark of 155 mph while the 0-62 mph sprint can be knocked in 4.9 seconds, 4.3 seconds, 4.1 seconds and 4.0 seconds respectively.